1. Marinate the chicken in the oil, lime juice, chili powder, cumin, oregano, garlic, salt and pepper in the fridge for 30 minutes to a few hours. 4. Saute the onions until tender, about 5-7 minutes. 5. Add the peppers and the remaining marinade and saute until the peppers are tender, about 5-7 minutes. 6. Remove from heat and mix in the cilantro. 7. 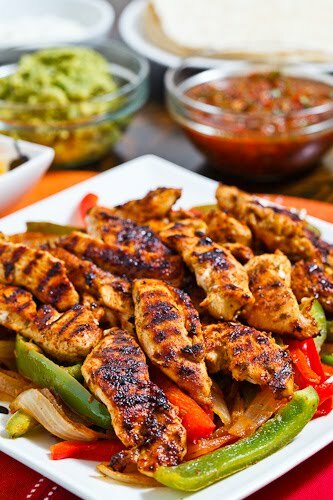 Assemble fajitas and enjoy.